Camino de Santiago on Horseback Tips: What do you need? Before making the Camino de Santiago on horseback, make sure you read these tips. One of the most interesting options to do the Camino de Santigo is to do it on horseback. Doing the Camino de Santiago in the company of an animal is an unforgettable experience. The first pilgrims traveled to Santiago on their horse. However, to make the Camino de Santiago on horseback stop taking into account some basic tips. It is not the same to do the Camino de Santiago by bicycle or walking than with an animal. You must be totally responsible with the animal and plan the trip well. Depending on the route, the Camino de Santiago on horseback can be a very long experience. Whether the journey is long or short, our advice is not to do the Camino de Santiago if you do not have the necessary experience. A little expert rider could have problems when it comes to overcoming certain routes and making wrong decisions with the horse. The rider must know how to ride the horse, but also have experience with these animals and always know their condition. It is important to know when the horse might have a problem or know how far it can go. If the rider does not have the necessary experience the Camino de Santiago can become an unpleasant journey, besides having many of the typical problems of people who start riding. Keep in mind that we will spend a lot of time on our horse, so our body can be affected. 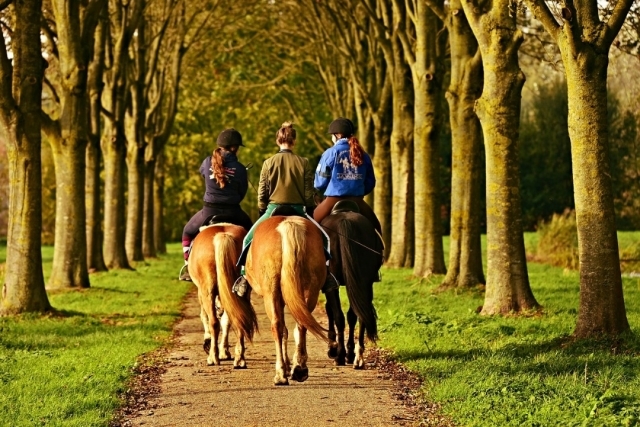 On the other hand, we must plan in detail our routes and breaks, without forgetting that our horse also needs to rest. Equally important is to keep in mind that the horse needs to eat and drink, especially during the hottest months. To do the Camino de Santiago on horseback you will need a saddle. The saddle should be of quality, but also comfortable. Our advice is that you do not open the saddle during the Camino de Santiago because you may feel uncomfortable with it or have certain problems. Do not forget to place a blanket under the chair, as well as the stirrups. The horse will need some care during the trip, especially in its hoofs so it is important to have a first aid kit for it. During the stages close to the road it is important that the rider and the horse go well marked. Planning the Camino de Santiago on horseback is not easy, especially if you travel alone and without help. The best and most advisable is to hire an organized trip to do the Camino de Santiago on horseback. There are specialized agencies to do the Camino de Santiago on horseback. The reason is none other than the care and maintenance of the horse. During the Camino de Santiago you can find a large number of establishments for pilgrims, but on the other hand there are few accommodations for the horse. In many occasions we will not find stables and if they exist they are far from the shelters. The best route to make the Camino de Santiago on horseback is to choose the Camino Francés, due to the large number of pilgrims who use it every year. If you want to contribute ideas and solutions to carry out the Camino de Santiago on horseback or tell us your experience, use the comments section.